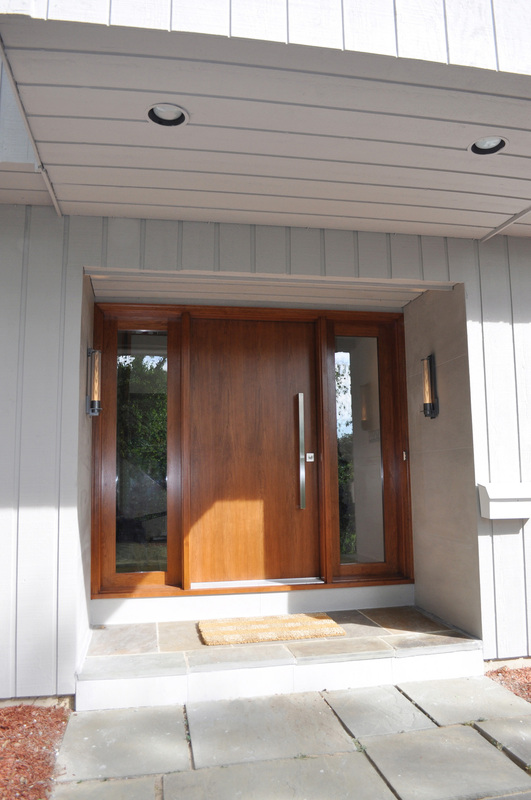 MODERN ASIAN ENTRY UPGRADES, Scarsdale, NY: A modern-styled residence built in the 70’s requires exterior paint and new entry door as well as key interior upgrades for placing it on the market. A warm oversized Cherry slab door with sidelights, modern metal mesh sconces and stainless door handle create an inviting welcome and curb appeal. A custom-designed modern iron stair railing opens up the entry space giving the twenty-foot ceiling space added architectural interest and a contemporary feature.